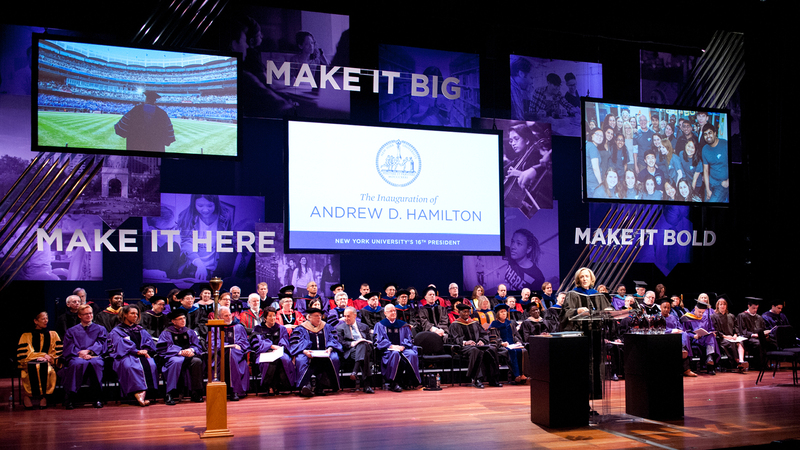 For the inauguration of Andrew D. Hamilton as its 16th president, New York University planned a week-long series of events designed to unite its many constituencies after a period of unprecedented global expansion. 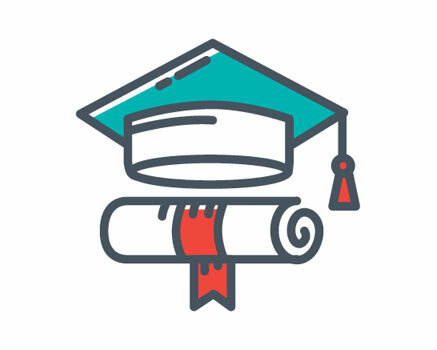 How do you bring together neighborhoods and international campuses, faculty and elected representatives, students and trustees in a way that makes them all feel recognized? Everyone knows the song. We used it as the basis for a brand integration strategy that created a messaging platform for the inauguration and the events leading up to it. 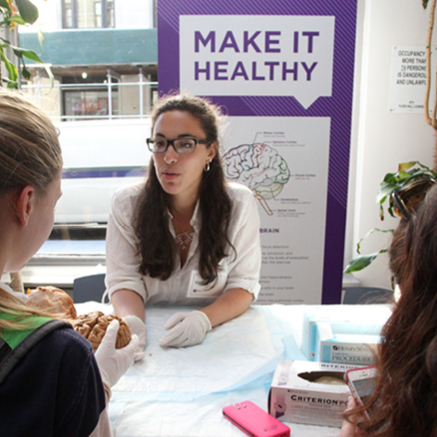 The campaign also gave NYU the chance to tell a multifaceted story. 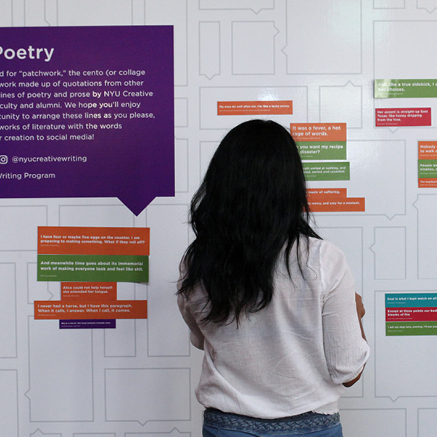 NYU is a place where students can “make it,” and there is unlimited potential to choose what they make. Or make of themselves. 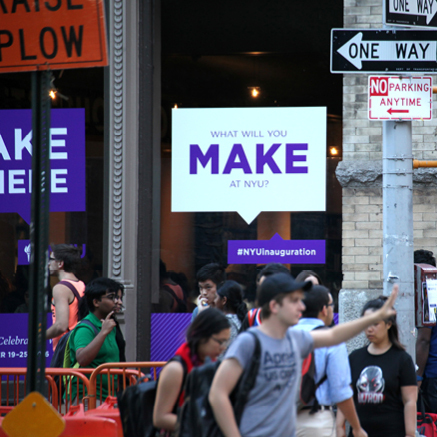 To draw in residents from surrounding neighborhoods and visitors, we designed Make It Here signage that was seen from NYU’s sprawling downtown campus to the inauguration ceremony itself. 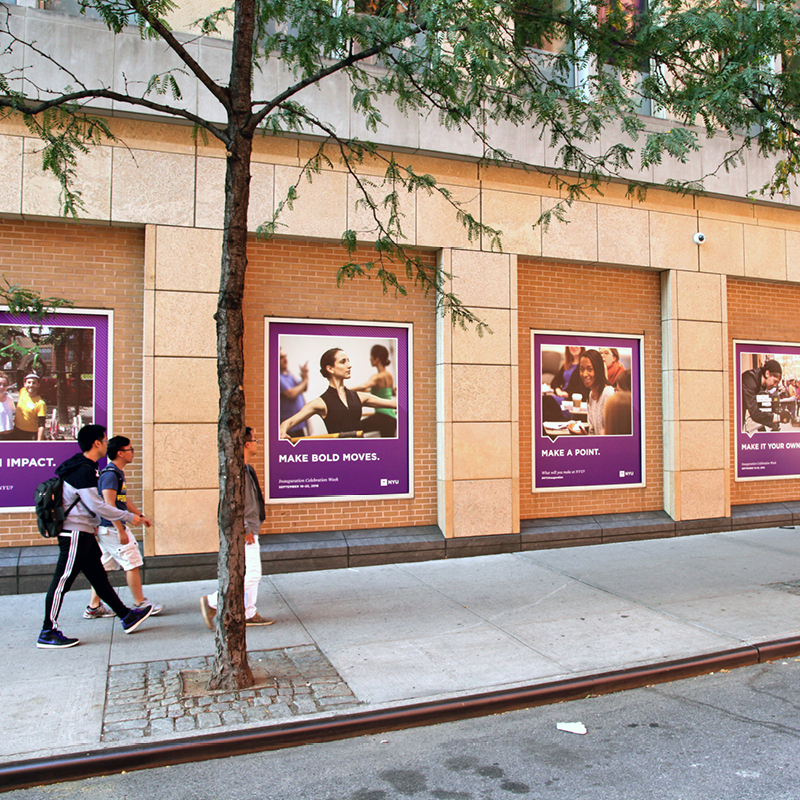 Window graphics, directional signage and digital displays encouraged passers-by to celebrate potential. 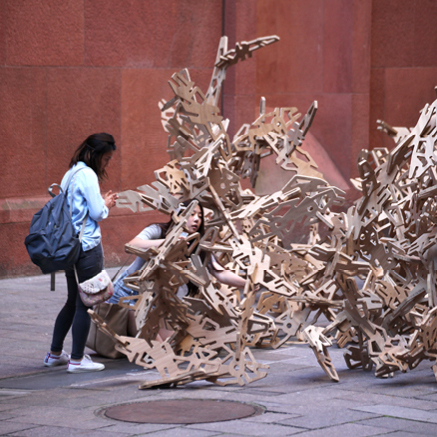 Identified and united by the campaign, the week’s talks and activities formed a series of “community squares.” These interactive spaces brought together diverse groups to explore topics ranging from meditation to technology and included the creation of a piece of public art. 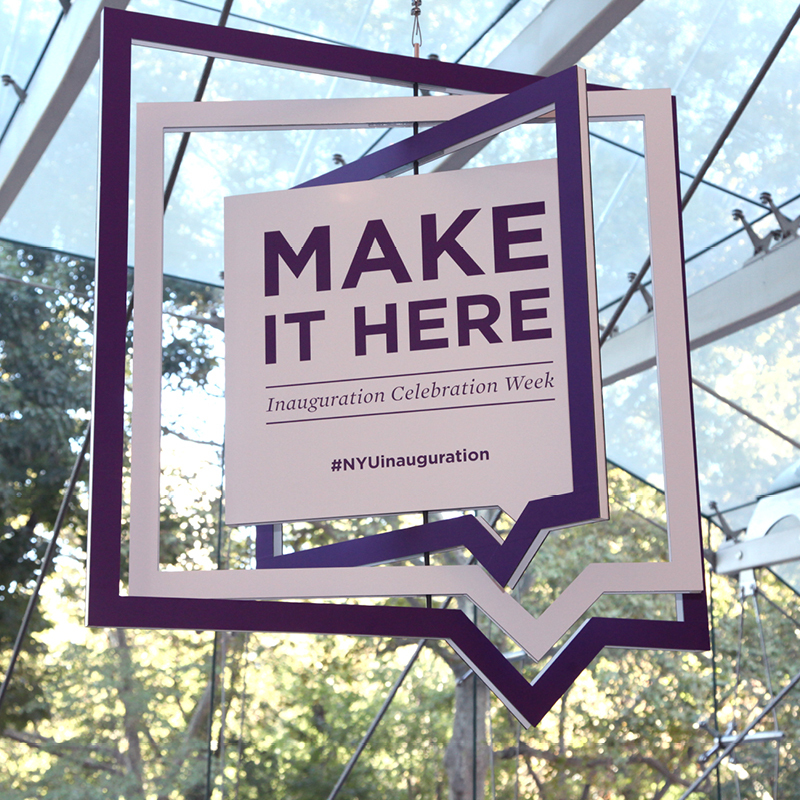 The inauguration ceremony was attended by higher education leaders from both sides of the Atlantic, prominent New York political figures and NYU students, faculty, administrators, alumni and trustees. 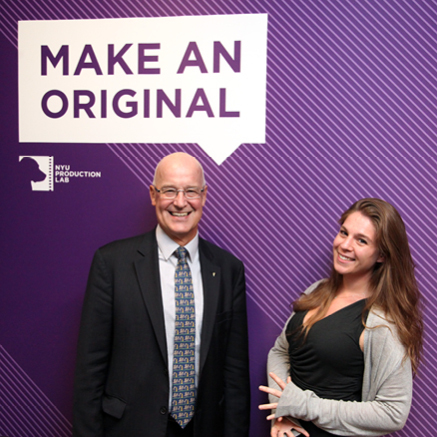 The Make It Here campaign provided a unifying platform for the ceremony, President Hamilton’s speech and the first-ever NYU Make a Difference awards. 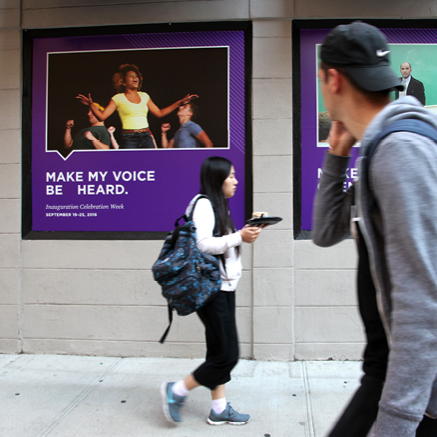 The awards, which recognize members of the NYU community whose efforts have a lasting impact on changing the world for the better, showed that making it “here” makes a difference everywhere.